In a letter to Energy Department employees today, Energy Secretary Steven Chu highlighted the tremendous progress of the last four years, and announced his decision to not serve a second term as secretary. Brazil-based ETH Bioenergy and Inbicon have announced an agreement to bring the second generation ethanol for the Brazilian market. The partnership will combine the experience of industrial and commercial ETH and technology and know-how of Inbicon. Research has shown that an ionic liquid proven to be effective for pre-treating individual biofuel feedstocks is also effective at pre-treating multiple different feedstocks that have been mixed and densified into a blend. Scientists have developed a way to grow iron-oxidizing bacteria using electricity instead of iron, an advance that will allow them to better study the organisms and could one day be used to turn electricity into fuel. The Renewable Fuels Association has submitted comments disputing a draft study on biofuels and food security published by the U.N. Committee on World Food and Security (CFS). The phones were ringing and multiple staff meetings were being held at the Iogen Corp. headquarters following the Jan. 31 announcement of Novozymes' acquisition of the industrial enzymes business of the Ottawa-based enzyme maker. On Jan. 31 the U.S. EPA published a proposed rule that creates a structured process for buyers of renewable identification numbers (RINs) to verify their validity. A 30-day comment period will allow member of the public to weigh in on the measure. Groups representing the U.S. ethanol and advanced biofuel industries responded swiftly to the 2013 renewable fuel standard (RFS) volumetric requirements released Jan. 31, pointing out both positives and negatives. The U.S. EPA is proposing the 2013 percentage standards for four fuel categories that are part of the agency's renewable fuel standard program (RFS2). The proposal announced today will be open for a 45-day public comment period. Spot prices for U.S. fuel ethanol were lower throughout most of 2012 compared to 2011. Prices were relatively stable during the first half of 2012, but they rose at mid-year as severe drought and scorching temperatures reduced corn yields. Novozymes acquires enzyme business from Iogen Corp.
Novozymes announced it has reached an agreement to acquire Iogen Bio-Products, the industrial enzyme business of Ottawa-based Iogen Corp. for CA $67.5 million and potential earn-out payments of up to CA $12.5 million. High corn prices, difficult supplies and tight margins have taken three more ethanol plants offline in recent weeks, including one in Plainview, Texas, one in York, Neb., and a third in Ravenna, Neb. On Jan. 28 Global Partners LP announced it would acquire 100 percent of the membership interests of an idled 110 MMgy ethanol plant in Clatskanie, Ore., as well as an onsite rail transloading facility serviced by the BNSF Railway, and other assets. ACE Ethanol LLC and Front Range Energy LLC have signed 15-year agreements with Sweetwater Energy Inc. to purchase cellulosic sugars for processing at their corn-ethanol facilities. The Wall Street Journal editorial board has once again demonstrated that it either does not understand why Congress decided to require oil companies to use cellulosic biofuels five years ago or it is not willing to tell the truth about it. The U.S. Grains Council has issued its 2012 Annual Report, which includes success stories from the year and market profiles from more than 25 countries and regions. The also includes export data on distiller's dried grains with solubles. The U.S. Energy Information Administration's Fuel Ethanol Overview in its January Monthly Energy Review shows that ethanol consumption for the first 10 months of 2012 was up slightly compared to the two previous years. The Coordinating Research Council has released a report outlining fuel test results that show E15 fuel can damage fuel system components. 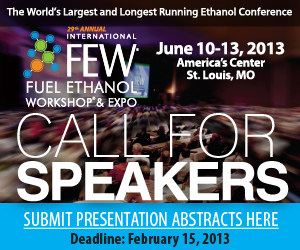 Representatives of the ethanol industry, however, are questioning the testing methods. A recently released European Commission proposal on deploying alternative fuels infrastructure recognizes the importance of biofuels but does not go far enough, said ePURE, the European Renewable Ethanol Association. The Bundesverband der deutschen Bioethanolwirtschaft (BDBe), a German ethanol trade organization, has released production statistics for 2012. According to the organization, German ethanol production increased by 7.4 percent last year.